Make a flour paste by adding wheat flour and water, consistency should be thin. Keep aside. In a big vessel put all the ingredients except oil and coriander and mix them well. Now put it on fire, cook it till minced meat gets tender and water evaporates. Keep aside to room temperature. Take one samosa patti and make a pocket at one end. Fill it with minced meat which is prepared earlier and seal the third (top) edge by applying a flour paste in it. 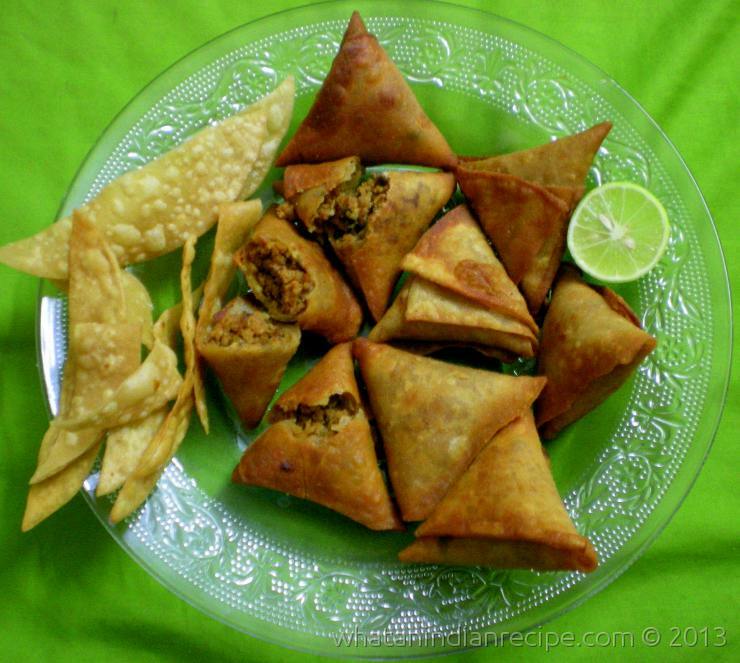 Deep fry these raw samosas in a medium flame till it becomes crispy and golden brown in colour. Serve hot with tomato ketchup, dhaniya pudina chutney or cut the samosa in middle and squeeze a few lemon drops on it.